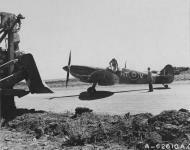 Ground crew of No. 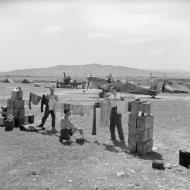 154 Squadron RAF hang their washing out to dry beside a dispersal at Souk el Khemis ('Victoria'), Tunisia, where two of the Squadron's Supermarine Spitfire Mark Vs are undergoing maintenance, (Mark VB, ER676 'HT-E', nearest). 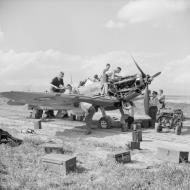 Ground crew servicing Supermarine Spitfire Mark VB, ER676 'HT-E', of No. 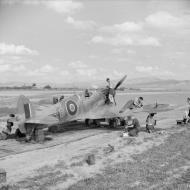 154 Squadron RAF in its dispersal at Souk el Khemis ('Victoria'), Tunisia. 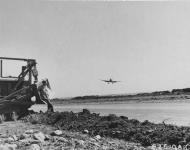 The aircraft failed to return from a mission escorting American B-25s to Tunis the following day.